One of the more exciting knitty adventures in 07 came from the most non-knitty place I expected. My school. I had an applicant who’s mother came to wait patiently for her while she took her entrance exam. The mother insisted on staying during the 2hr exam and it wasn’t until I saw her whip out her knitting needles that I understood that it truly didn’t matter where she was – she was knitting! It was a gorgeous cashmere poncho and I couldn’t help myself so I had to ask! 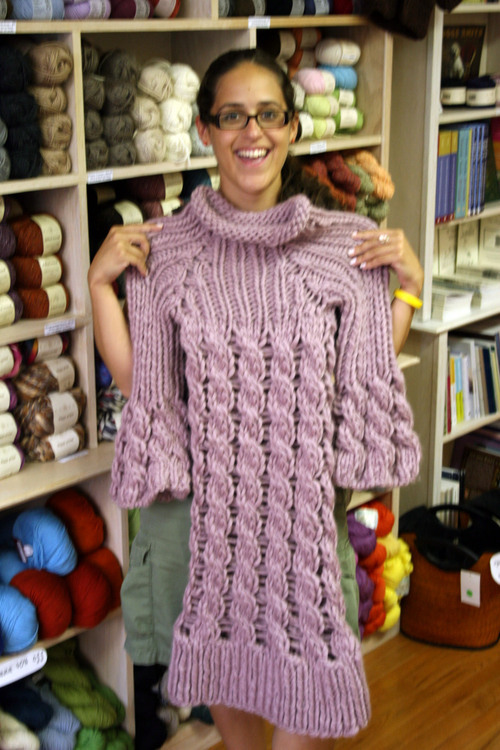 Her name was Lisa and she was test knitting a Marc Jacobs poncho for her job at Soho Publishing aka Vogue Knitting. With that I totally freaked (but obviously in a good calm professional Admissions Director way) and casually told her that I too was a knitter and had some work with me! Kindly she asked to see it. It was around the time I was knitting Fifi and I had it with me to show her. She liked and offered to take my card because VK was always looking for some test knitters. In my head I was like take one? take many! So we kept in touch and that following August I got an email asking if I was interested in test knitting a sweater by Twinkle. Hello! Absolutely! Obviously with the whole copyright infringement I couldn’t post about it but now that the magazine is out – game on!! My first suare into test knitting is the Twinkle Dress on pg. 90. That’s my handy work, baby! Sorry for the blurred pic (and oh how tan i used to be… sigh)! Then on the model in the magazine… dude she’s tall…. I really enjoyed working on this dress and loved the yarn, Soft Chunky by Twinkle. It was luxuriously soft and very close to the Blue Sky Bulky yarn I’m more familiar with. The pattern is fun and knits up Super Fast – and we’re talking a dress here! I also liked how they paired it with a dress underneath too – it’s perfect for layering. Test knitting was also a great experience for me. Figuring out the pattern from a sketch was great practice at seeing how the sweater was put together. It allowed me to get more on the technical side of my knitting which was a challenge but definitely built my confidence in hopefully making my own designs one day! All in all a really great experience and I look forward to doing more for them in the future! 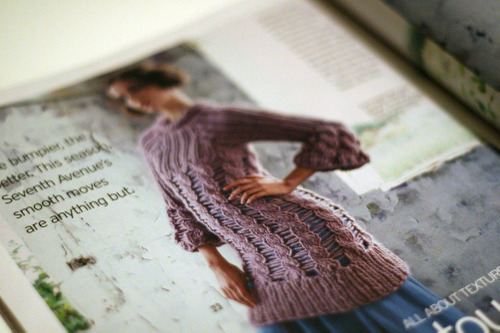 I’ve been drooling over this sweater ever since I got my VK in the mail- congrats, Margaux! How fun that you got to work on that. how exciting and cool! lucky you! That’s fantastic! Congratulations!!!! I can’t wait to get my hands on the magazine. oh how cool!! I remember when you first told that story. I ams so glad it worked out in the end, especially with such a wonderful FO as your reward. WOW! That is so cool. I love your handiwork and am eager to see you start designing. Congrats! Great color and a great knitting. Good to hear that the Twinkle yarn is another good option. I always like seeing what you have knit. Wow, what a cool experience! Your dress is incredible!! Yeah! That’s the coolest knitting story ever. I think I would have messed on the chair. I’m that big of a dork. Super exciting! I want you to sign my copy. You did a terrific job. The dress is lovely. It’s so nice to see the process behind this dress, the human who actually made the sample! Excellent knitting. It’s a lovely piece and I’ll definitely be making it. That is so cool! Congrats and what a fun and exciting experience! That’s cool! Your dress is fabulous! That is gorgeous! You are Famous! That is gorgeous! What a neat thing! beautiful dress and very cool story! Oh my gosh, you really do rock the casbah! Congrats! What a cool experience! Congratulations! It is really exciting!!! what an amazing experience! i’ve often wondered how people get into test knitting. that dress is fabulous! You are and amazing artist i love all the things that you do. Go girl!!! Congratulations! The dress is fantastic, and so well-knit! How outstanding is the dress and you!! I’m so proud of you and wish you were close by to get tutoring lessons from you in knitting. I’m so happy for you. Wow! yours is lovely!!! I’m having a problem with the sleeve! The setup row has you complete the repeat with K3 and then you K5 (the last 5 stitches). then in the next row it’s telling me to P5*drop dble YO off needle…. Drop what double YO? The setup row has you end in what is K8. There is no dble YO between the K3 and K5 ending. I’m assuming you didn’t have this problem… b/c yours looks fantastic!